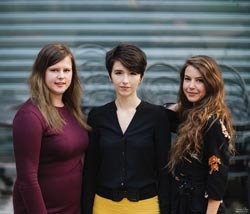 Distinguished by a powerful on-stage unity and a rare sensibility, the Trio S&omacr;ra was born of a burning passion for chamber music shared by close friends at the Paris Conservatoire. Influenced by their diversity of heritage  France, Latvia, Italy and Basque  they have vivaciously launched into full flight, not unlike the significance of the native american name S&omacr;ra: a bird singing while spreading its wings. Always striving to deepen their musicianship, the Trio S&omacr;ra is benefiting from the guidance of the Artemis Quartet and Miguel da Silva at the Queen Elisabeth Music Chapel and Claire Desert at the Conservatoire Supérieur de Musique et de Danse de Paris. They have also been privileged to work with such artists as Menahem Pressler, Quatuor Ébène, Quatuor Danel, Mathieu Herzog and Gary Hoffman. The violinist Magdalena Geka plays a 1737 Camillus Camilli violin generously loaned by the Queen Elisabeth Music Chapel.